For the first time in years distressed sales were less than normal or traditional sales, down to 45.26% of all sales in April 2011. March 2011 saw 901 distressed sales while April produced 683 distressed sales resulting in a decline of 24.2% We had 51 fewer short sales and 167 fewer foreclosure sales in April versus the previous month. Overall we had 163 fewer transactions. Traditional sales actually rose from 765 in March to 826 in April, so the lower distressed sales are helping the overall market. Perhaps this is why official prices have risen over 15% since January. Next week official numbers will be released and we’ll of course be tracking prices. We can say that pending sales are down 9.97% from March numbers, and this can be attributable to seasonality of home sales and falling inventory levels. March 2010 was the first month in years with inventory of single family homes below 10,000. March numbers stood at 9,785 and current April numbers stand at 8,718. That’s a drop of over 1,000 units in just one month. We’ve been seeing inventory levels drop since February at a rate of about 500 per month, but April’s drop was the sharpest we’ve seen in awhile. To put these numbers in comparison, we tracked 12,669 active listings back in October 2006. 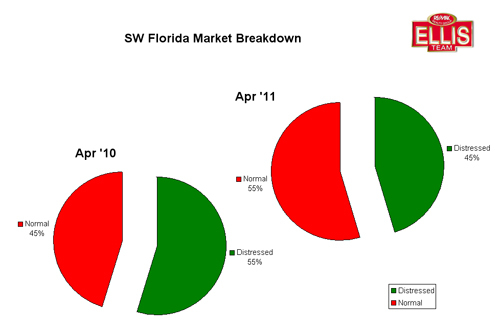 The Ellis Team SW Florida current market Index now stands at 3.14, which is the lowest since September 2005 when it stood at 2.11. It rose to 3.44 the very next month and was a sure sign of what was to come. This Index accurately predicts the future direction of the real estate market. Back in 2005 it began rising which told us the market was in change. Later on the public and media began to see what the numbers were telling us. Fast forward to 2011 and we’re seeing similar numbers, but they’ve been heading steadily down, which means the market has been shifting from a buyer’s market to a seller’s market. Now don’t get too confident if you’re a seller as the overall economy is still limiting price increases, but this is good news for a market that bled for years. SW Florida was long known as the epicenter for the housing crisis along with Phoenix, Las Vegas, and California. Today Fort Myers and Cape Coral is actually faring better than many parts of the country, although better is a relative term as unemployment is still high and many people are struggling. Our market has been in the healing process, and while there is still more healing to do, it’s nice to report a little positive news after years of misery. In fact, people from all over the world have been contacting us recently asking about our market as they’re beginning to read that SW Florida has bottomed and it may be time to get in on the good deals. Our real estate is certainly affordable, and probably about as inexpensive as it’s ever going to be, so people want in on the deals. It still strikes me as odd though as people from all over come here to buy and they still offer ridiculously low offers when they know full well we’re experiencing a shortage of certain homes in certain prices, and they’ve read that prices are going up. You just have to wonder what makes them think they can low ball in a rising market. I think the answer is greed, and unfortunately it is this same emotion that got us into this mess years ago, and it is this same emotion that will prevent certain people from buying in this market as they’ll always be in search of the deal from last year, ignoring what is occurring in today’s market. I’ve always said, if you wanted to sell in 2005, you had to price it right and actually sell it in 2005, not 2006, 2007, or 2008. And if you want to buy today, you have to step up and get a great deal in 2011. You missed 2010 pricing, and if you’re not careful, you’ll miss 2011 pricing. Today’s pricing is still far below replacement cost and is artificially too low, however it looks like we’ve bottomed and are moving up, and it’s a little late to go for blood when the wound was bandaged months ago. Posted in Southwest Florida Real Estate.Tagged Cape Coral real estate market, Fort Myers real estate market.